On Wednesday we found out that our dear friend, E.L. Thomas lost his battle with cancer. Earlier that week, on Sunday, we learned that an old school buddy passed away. I really wanted to attend both services to support these people and their families. Here is the problem; both services are scheduled so close together that I can’t go to both. What should I do? Here is my reasoning (good or bad, right or wrong). E.L. was a good friend whom I loved, respected, appreciated and admired. He was a big part of the church and gave all that he could to seeing that the work of the church went forward. He was a Jesus man and everyone knew it. My old school buddy is a person I knew in the 8, 9, and part of the 10th grade. We played sports together, delivered papers together, failed at Boy Scouts together. We weren’t real close but we did a lot of the same things – so we were in the same ball park of thinking and doing. I moved away to another town in the 10th grade and did not see this friend for 53 years now. Since retiring I have tried to locate him to get reacquainted, but no one seemed to know exactly where he was. It was as if there was an official edict given that his name not be spoken. It just seemed so strange. Later, especially this week, some information came dribbling in: He graduated from high school, went in the Navy where he served a tour in Vietnam. He went to college and retired from being the greens keeper at one of the local golf courses. All of that was in his obituary. What was not in there was the back story of his life. I have heard from several friends and my family members that he had a problem with drugs. Don’t know what kinds. I do know that for some people one taste and you are hooked. Some say that some drugs are so strong that it attacks the pleasure centers of the brain and you would rather have that drug than any thing else… even friends, family, etc. I don’t know what my friend was in to, I just know that he spent some years in and out of prison. Like I said, I don’t know what my friend was into… but I do know one thing… no matter what it was, he was and is still a child of God. His life may have taken him to darker paths than most of us traveled… still Jesus was close at his side. He may have done things that were outside the norm and most of us would find appalling. Still, still Jesus was holding him close. You will notice at the bottom of the header (above) are a list of my books. 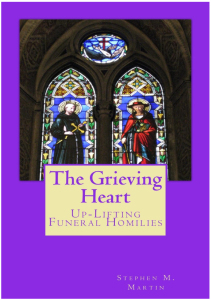 I have added the last one so you can order The Grieving Heart in paperback form. All the other books are eBooks. I hope that you will take the opportunity to read these and I hope they will help to bring you comfort and grace in time of need.